Product pages aren't just a pretty landing page for purchasing. They are your online doorway to gaining customers and revenue. We've deconstructed the outstanding features on each of the chosen sites (and spotted some other key areas for improvement). This post is designed to help you keep up-to-date with some of the latest trends, using examples from the top ecommerce product pages out there today. 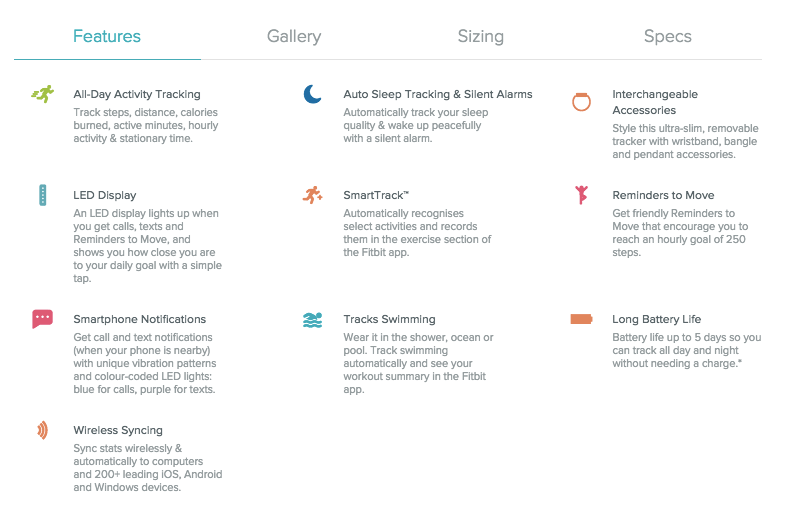 Fitbit is an innovative and successful company that creates wireless activity and sleep trackers. Their website stands out because it has a different twist on the typical product page style. They only have a few products, and therefore can concentrate on some incredibly tailored, content-rich and engaging pages. 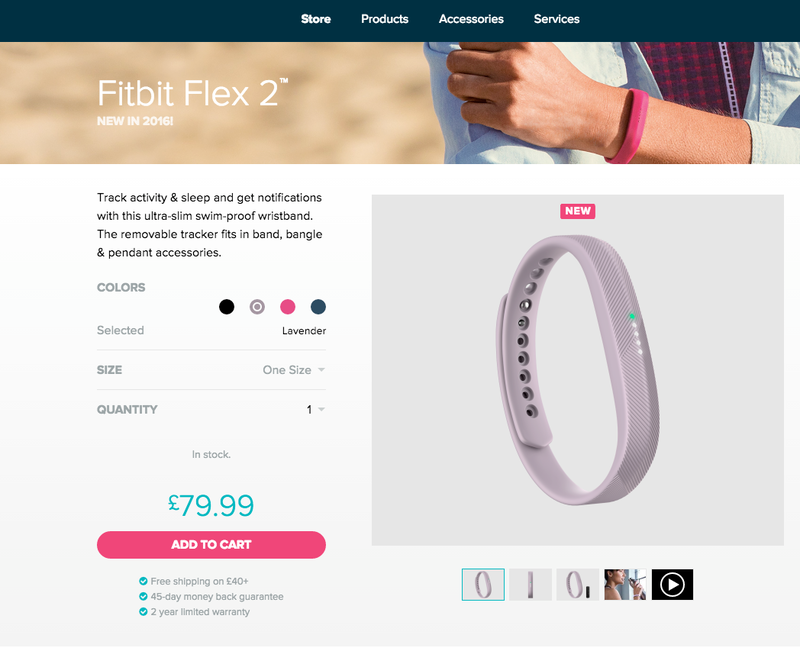 Fitbit sets a standard for creating content - a standard that should be a goal for all ecommerce companies out there. Video: Very engaging, great design and most importantly it explains all the key features in a clear and concise way. 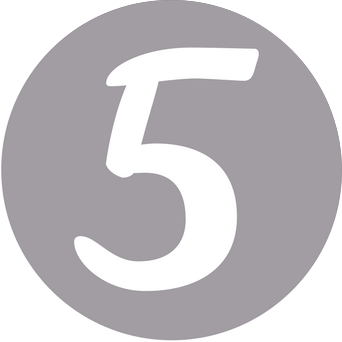 Users can get a great understanding of the product in approximately 1 minute, and if they're interested they can read more in the additional content on the page. It's very important to put across your main value propositions as quickly as possible, and video is a great way to do this. Fitbit provides the perfect example. 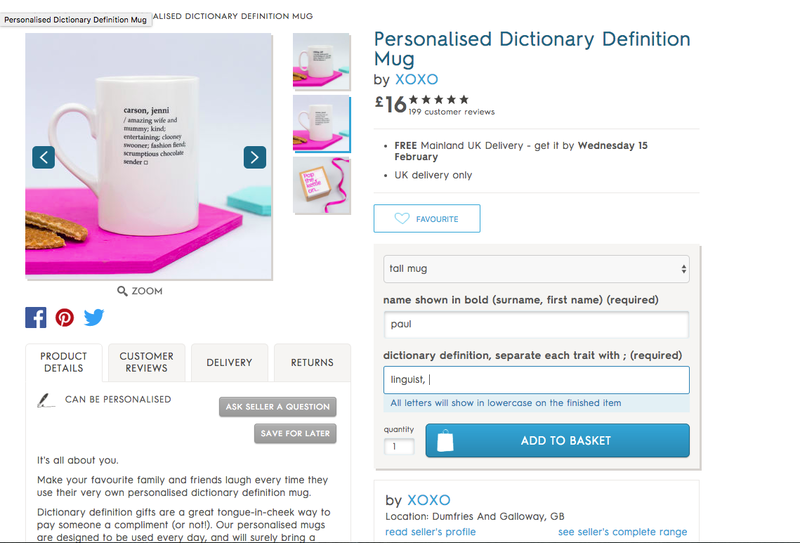 Product description: A really unique but appealing design and layout choice for their product descriptions. They quickly summarise the main product values above the fold to ensure visibility, which as you scroll down is followed by in-depth and visually appealing details on specific product features. The copy is very clear, makes good use of white space, utilises icons, bullet points and value propositions in the subheadings. All of which create a transparent and time efficient way of putting across the main product value propositions. The quicker the customer understands the product (and can determine whether or not it fulfils their needs in some way), the more likely they will be to convert. This is especially important with products people are not familiar with. Stand out CTAs In places, there is the opportunity to make the most important CTAs stand out more, with more careful selection of colours to draw attention more effectively. A fashionable and design-conscious creator of bangles, bracelets and earrings and other jewelry, AlexAndani have one of the most clean and crisp product pages in our review. They cover all the important aspects extremely well whilst conveying their brand in an appealing way by including small but very important features. Stock information Quick and clear stock information on your product pages saves your users from a disappointment later on in the checkout. AlexandAni not only remove unavailable products from their dropdown menu, but also give you the option to receive a notification when they appear back in stock. Video: AlexandAni also include well-produced, informative videos for consumers interested in a product. Zoom functionality A visitor can easily zoom in on the product being viewed to obtain a more detailed view of the jewellery up-close. Product care Fantastic product care section with how-to videos on cleaning bangles among other great tips. This preemptively addresses an area of interest for many of their customers. Product descriptions should go beyond a simple outline of the product and go into depth on any questions or problems potential customers will be thinking about. I.e. alleviate their concerns to increase trust and reduce risk. 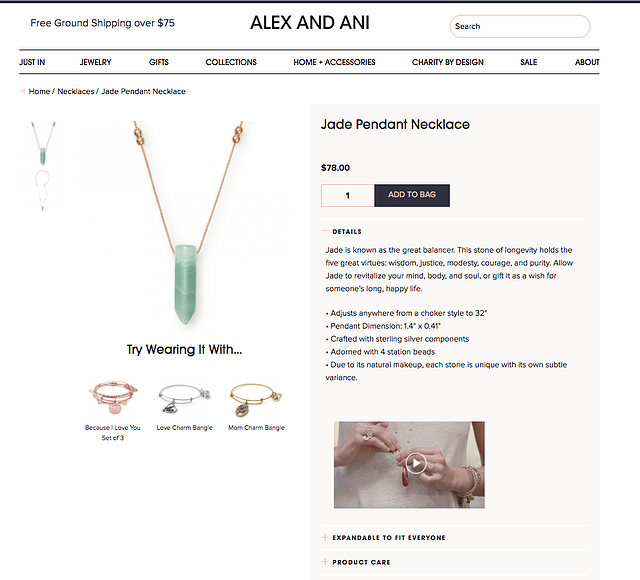 Make more of social We'd like to see AlexandAni make even more of its strong social media following and/ or user-generated content alongside product pages. Shopbop, a store for women's designer fashion brands, has not only been around since the early days of ecommerce, it is also owned by the king of online retail - Amazon. As you would imagine, they have some of the best product pages in the business, including innovative features and exceptionally high quality images with seamless video. Product demonstrations in video for certain products, which work seamlessly in the central section of the page. Additionally they have made sure that it is the same model in the videos as in the images. The videos are taken in catwalk style which matches their target audience interests and values perfectly. These videos are exectuted to a very high standard which really immerses you in the shopbop experience. You can instantly see the time and effort gone into taking well executed professional photos which really sell the clothes. All images include a click to zoom feature which really enhances your ability to view each detail of the product. This is essential to help reduce any doubts about product quality and reduces the gap between the offline and online shopping experience. The collapsable features of the product & shipping details are a great example of how you can include a lot of information on the page without taking up too much space. Prioritise the information you customers will immediately want to know and make it easy for them to discover other useful information they will desire as they research a product in further detail. Shopbop focuses on the product description first to grab the initial interest and further information is easily accessible directly below it. 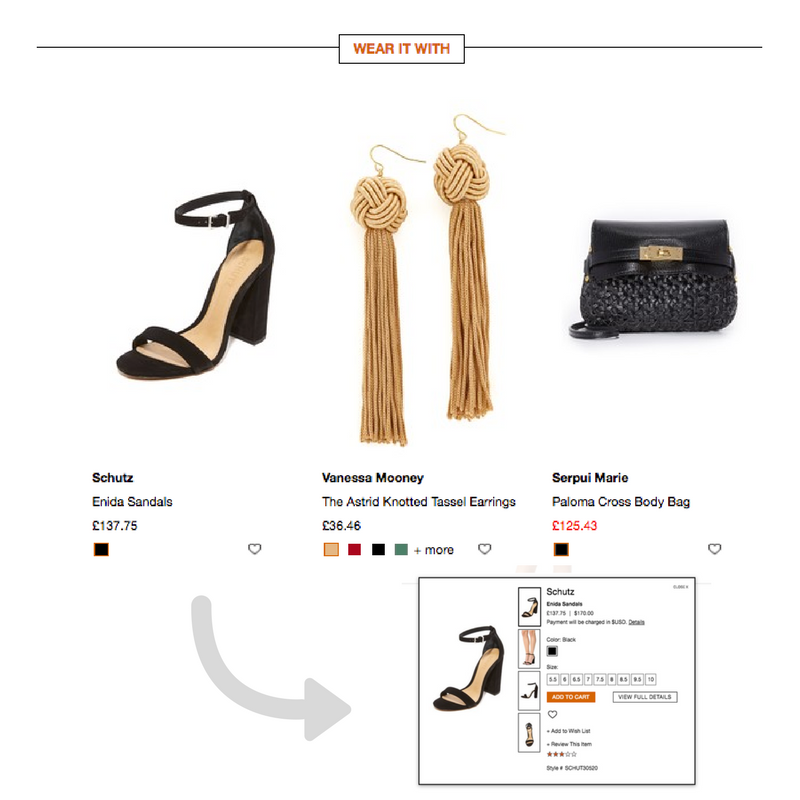 The functionality to click on one of the product recommendations, located below the product image, and view a brief overview in a pop up rather than having to navigate to another page, is an exellent illustration of great usability. The scenario where people want snapshots of other related products whilst still maintaining focus on the first product they viewed happens often. It frustrates your customers if you have to load new pages all the time to view other products. There are user reviews, however there is hardly any focus on them and it's not immediately apparent that you can leave a review. This reduces social proof and increases the perceived risk for the prospective customer. A UK store that achieved rapid success, its extensive range of unique goods from small independent retailers is backed up by well structured and visually attractive product pages. The prominent feature here is the product customisation feature on the vast quantity of their pages. 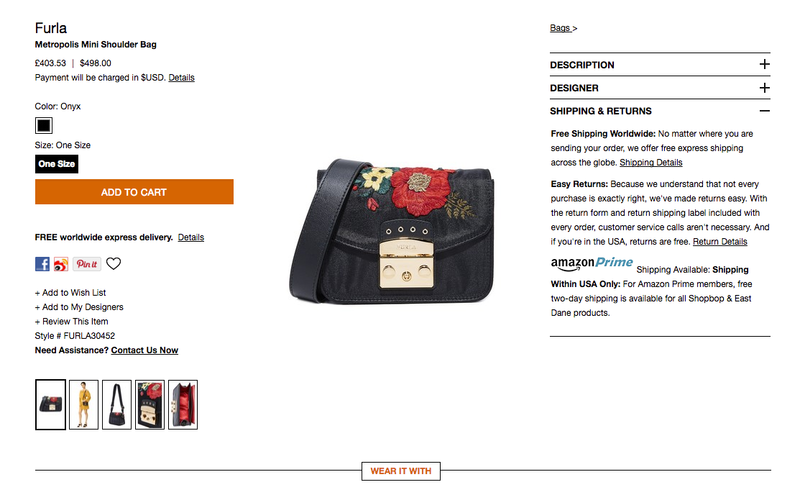 A great example of how you can integrate a personal touch into purchasing products online. Allowing customers to personalise products can provide the differentiation required to stand out in a crowded online market. Some of the first questions many customers will want answered are about delivery and returns, therefore you should never hide this information. Not On The High Street have very clear delivery information under their prices, and easy to access tabs that go into further detail on delivery and returns. Answer all possible questions including delivery time frame, international delivery options and any specific rules you have about accepting returns. There are primary and secondary CTAs which focus on key elements such as add to cart, save for later, and "ask seller a question". The problem is that the colours used for the CTAs blend in too much with the surrounding elements. Adding some contrasting colours that are different enough to stand out would provide a clearer layout for the page. Nobody's Child is a London-based fashion brand aiming to spread the word that fast fashion "doesn’t have to be synonymous with low quality or questionable manufacturing practices". According to its website, the brand weaves and dyes its own fabrics, designs and produces its own own prints, and makes its garments in its own factories. The main feature of Nobody's Child's product pages are the products themselves. 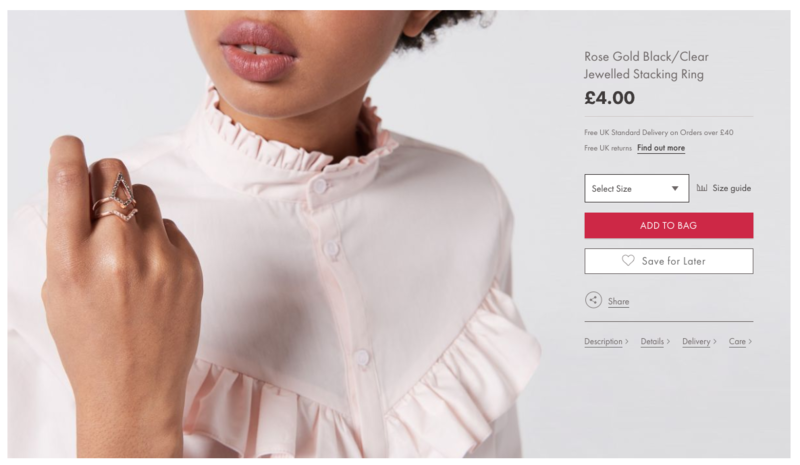 In the product page copy and pasted above, the photograph of the model dwarfs any other content on the page - with the product being promoted (the stacking ring) the primary focus. Striking, good quality and full bleed images such as this one ensure a website visitor stays engaged once they've selected to view a product. Similar to the ecommerce brands listed above, Nobody's Child also offers its customers detailed information on their products and service. For a bigger impact, Nobody's Child could make a bit more of certain buttons and tabs as, even though we like the fact the product/photograph is the main feature of a product page, certain CTAs/tabs are a bit lost. For example, instead of a hyperlinked "share" button (included underneath the "save for later" CTA in the screenshot above), the brand could just display the different social icons on the product page itself as they would not take up too much room but would be more visually interesting. I hope the above gives you some inspiration to improve your own product pages. Ecommerce is an expanding industry - with the quality of websites improving rapidly - so it's becoming increasingly important to really optimise your product page to make it as beautiful and user-friendly as possible. If you find this post appealing you may also be interested in our ebook - The Ultimate Product pages for Ecommerce. A guide to High Converting Product pages - which goes into detail on all the key product page features, and how you can create the perfect product page for your online store.